Companies across New Jersey work hard at being successful. At the same time they realize that it is only through people that goals get completed and achievement happens. Paying attention to employees in a positive way and involving them in process just makes sense. Employee engagement is central and core to all values and guiding principles. A solid workforce usually means superior performance. When it comes to people, research has shown that engaged employees greatly outperform those who are not engaged. 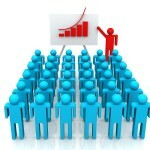 The goal for every business is increasing the engagement through leadership and understanding. These two ingredients are key differentiators and they provides a clear and competitive advantage. Employee communication: Involvement means interaction. It always is a clear two way street. Relationship with management: Immediate supervision is central to morale, guidance and opportunity. Belief in leadership: The basis is trust all the way to the top. The work teams must be confident in their management. Opportunity for advancement: The chance to grow and contribute is priceless to every team member. Positive and constructive feedback: People do make mistakes and no one is truly successful without some failure. Coaching can mean everything. Organizational values: Everyone has them, supports them and shares them. Today employee involvement and loyalty to the company and organization are more vital than ever. As we finish 2013 and head into the unknown of 2014, positive interaction with an increased focus on team and team building is the cost effective way to grow and prosper. People mean success. All they need is an opportunity to get better every day through a variety of situations. Leadership can create a climate of involvement and engagement; make it the corporate agenda for your winning organization.